The Identity of the Author of the Book "The Gurus, the Young Man, and Elder Paisios"
Question 20: Do you know the real identity of the author of The Gurus, the Young Man, and Elder Paisios? We know the author gives himself the pseudonym "Dionysios Farasiotis", but do you know his real name? Answer: Yes I do. His real name is Athanasios Rakovalis. He has also written the book which is translated in English as Father Paisios Told Me. I will go into further details on this very soon in a separate post probably on my Orthodoxy and World Religions website. Question 21: What do you think of this article "The Byzantine Origins of Gun Control"? Answer: I think the article is silly and irresponsible, because it clearly has a political motive in the context of the American debate on gun control today. We must remember, the Roman Empire at no time was a democracy, nor was it a government by the people for the people. Under the laws of Justinian, private citizens had very few rights, though it was the most progressive form of government until that time. For example, private citizens could not wear gold and silver embroidery nor the color purple, which was imperial. Justinian was also noted for establishing monopolies for the benefit of the government. Regarding the army, he reduced its numbers and tried to reduce the expenses on its upkeep. The names of the dead remained on the lists, new soldiers were not recruited, and there was no promotion. The old practice of Imperial donatives every five years was discontinued. Pay was always in arrears, and was often refused altogether on various pretexts. No sooner had a soldier received his pay than the logothete appeared with a bill for taxes. Based on these things alone, its no wonder he also wanted to ban the citizenry from having weapons. To further put it into historical context, this law was written probably after the Nika Riots, where we are told the citizenry had weapons during the riots but were no match for the soldiers. To ban the citizens from having weapons would have made Justinian's job a whole lot easier in keeping peace and avoiding the slaughter. It was merely convenient. Much more can be said about placing this law in historical context, which the article fails to do at all, but it also must be noted that within a few centuries the Roman Empire in Asia Minor was divided into large themes, or military zones. Centralization was maintained through the appointment of a single official with both civil and military responsibilities, but the real innovation of the themes was how the land was settled by imperial troops. In essence, the soldiers became permanent farmers who could be called on for military service yet would be self-sustaining. Byzantium’s strength was fatally undermined when the government lost control of the countryside and either acquiesced in or abetted the formation of private landed estates. The farmer-soldiers were steadily alienated from their land, often owing to exorbitant government taxes, and became instead tenant farmers under increasingly independent feudal chieftains. This destroyed the effectiveness of the Roman army and also led to a drop in productivity and in tax receipts to the central government. Eventually, politics in the Roman state became a competition between what we would recognize as private-interest groups, aristocrats and feudal landlords, who reduced state policy to the padding of their pockets and the settling of personal disputes. American democracy figured out a way to avoid the traps of the past in a better and fairer way, to make things work for all people and not just the powerful. Byzantium would never have allowed the Constitution and the freedom it gives to the people. Therefore, if you are going to tout gun control in America based on the comparatively primitive laws of Byzantium, then you better be ready to give up the rest of the American Constitution too, because the laws of Byzantium contradict the whole thing. Just like you can't compare the United States with any other country in the world today, more so you can't compare it to a government that has been dead for centuries, no matter which side of the gun debate you are on. Question 22: We are all very familiar with the final warning at the end of the Book of Revelation: "If anyone adds to these things, God will add to him the plagues that are written in this book" (22:18). I have been wondering for a long time who this warning applies to. There are many interpreters of the Revelation (I am talking here about Orthodox interpreters, saints and respected figures in the Church today), and those interpreters offer a significant amount of information not contained in the Book itself. So, strictly speaking, doesn't that mean they are "adding" to the Book of Revelation? Answer: There are a few ways to interpret this passage. You can literally interpret it as not adding anything to the book itself, by interpolating things that do not belong there. But I also do believe that adding prophecies concerning the end times is included in the condemnation here. This is something I have been saying for many years, especially when Orthodox people promote modern saints and elders as giving prophecies about the end times. Of course, these are not prophecies, just traditions they hear which have been handed down to them over the centuries, and these traditions have been seen as a way to interpret Revelation. None of our modern saints and elders claim to be giving a new revelation from the Lord concerning the end times, they are just repeating things you can read in documents going back hundreds of years and putting it in a modern context. That is why Elder Gabriel Dionysiates interprets the locusts casting fire upon the earth as atomic bombs. Did he have a special revelation that it was atomic bombs? He never said so. He just gave his own interpretation, which was also shared by Elder Joel Yiannakopoulos. What I would be weary of is if someone said that they have received a new prophecy from the Lord concerning the end times. Unfortunately, this is how many Orthodox receive the apocalyptic traditions of centuries past based on apocryphal sources promoted in many monastic communities especially today, many of them even being contradictory. Question 23: Revelation 20:15 says: "And anyone not found written in the Book of Life was cast into the lake of fire." The consensus among even the most traditional and strict authors is that, at least the unbaptized children of Orthodox parents won't suffer the torments of hell, despite the fact that they won't enter the Kingdom of God. This is directly discussed in "The vision of blessed Gregory", a disciple of Saint Basil the New. The part about unbaptized children is just before the judgment over heretics section. 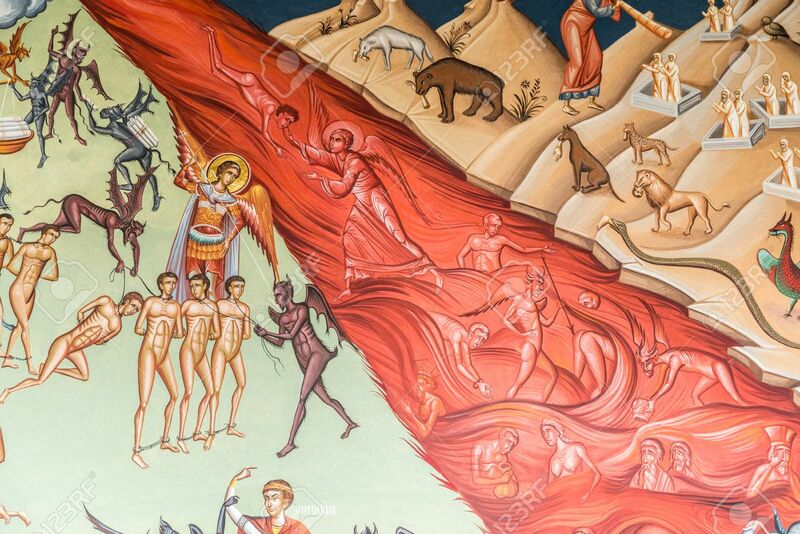 Also, some authors like the very respected contemporary Archimandrite Raphael Karelin write about hell (context implies he means Hades, not Gehenna): "At the outer rim of hell are unbaptized children and the best (among) pagans. Hell fire doesn't reach them, they don't feel the torment, but God is not there." It wouldn't make sense to me to have these people spared from any torment until the Last Judgment, only to have them cast into the lake of fire at the end of history. Answer: The only place you will find such silly teachings is in documents like the Life of Basil the New, which was never accepted in Byzantium and only became popular centuries later among the Slavs. This Life was written at a time when many fictional tales of saints and apocalyptic literature were being produced in Byzantium, but this and others like it were never accepted by the Church until the Slavs took them and made something authoritative of them. The Life of Andrew the Fool is another one, condemned even by Saint Nikodemos the Hagiorite. God alone is judge, and He alone can judge justly. Anyone trying to play God by giving a generalized judgment on a group of people and creating a sort of purgatorial state for them does not fall in line with Orthodoxy, even if done by a saint. There is another brief and curious text from the period, the Vision of Kaioumos, which tells of a wealthy shipowner, merchant, and landowner of Constantia, a certain Philentolos son of Olympus. Philentolos supported the poor and orphans and built a hospital. He was, however, prone to fornication. After he died, debate arose among the bishops of the various sees on Cyprus as to whether Philentolos had been saved. Since no agreement could be reached, Arkadios consulted the monks in monasteries, the stylites, and the hermits. Eventually God revealed in a vision to the hermit Kaioumos that Philentolos was neither in heaven nor hell, but was standing between the two, with the souls of unbaptized children, saved from the fires of Gehenna by his generosity. This vision seems to indicate that it was a common theme among fictional vision literary accounts of the time. These tales can be beneficial, but should not be seen as authoritative and literal. But to address quickly the issue of unbaptized infants, a Synod of the Church of Greece in 2001 issued an encyclical addressing this issue. It basically says that unbaptized infants are saved by the grace and mercy of God alone. This is based on the innocence and victimhood of infants who have no sin as mentioned by Gregory of Nyssa, that unbaptized babies can be found buried in ancient Christian cemeteries, and all traditions regarding the intermediary state of infants in the afterlife are based on superstitions. I should further add that Clement of Alexandria said that it is not the omission, but only the contempt of the sacrament of baptism that is damning, a maxim which can be applied to unbaptized infants. Question 24: Is there anything in Holy Scripture without significance? Answer: The Lord in Matthew 5:18 seems to imply that nothing in Holy Scripture is without significance. It is a basic principle of patristic hermeneutics. It is all inspired by God and has a purpose, even if there is a apparent contradiction or an error. Question 25: Can the devil and demons repent? Answer: No. Saint John of Damascus explains this in On the Orthodox Faith (3.3). For the role they played in the fall of man, they cannot be forgiven, because they are incorporeal beings. Thus, they cannot repent because they do not have a body. The only reason man can repent is "due to the weakness of the body." God takes pity on us only because "the flesh is weak, but the spirit is willing."